French School of Austin was founded by a family of educators upon principles of multilingualism, multiculturalism, academic excellence, and exclusivity. Our mission is to foster respect, integrity, and self-discovery in a compassionate, multicultural, and small environment. The school is a learning community that ensures high academic achievement for all students in both French and English, develops leadership, and values other cultures, systems, and practices. Through our rigorous academic curriculum, music, performing arts, and our celebration of diverse cultures, our students learn the skills and values they need to become influential participants in their communities. 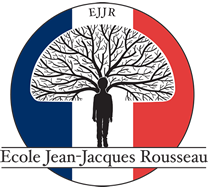 School Hours 8 A.M. to 4:00 P.M.
After School Care until 5:45 P.M.
Ecole Jean-Jacques Rousseau is a preparatory French Immersion Program, non-sectarian, privately and family owned, where the talents of bright and motivated children are recognized, nurtured and developed to their full potential. This school is a gem. Small classes, high-quality nurturing teachers, kids are respectful, the love of learning is upheld and every child feels like they have their place in the community. After only 2 months in PK3, we saw a tremendous growth in maturity, independence, and language acquisition in our child. We are impressed with the director’s leadership style that sets the tone for a harmonious, organized, clean, and collaborative environment. The French curriculum – both culturally rich and intellectually challenging – is accompanied by advanced English and Singapore math programs, resulting in a well-rounded education. We also love the performing arts and music component of this school, giving each child the confidence to perform in front of audiences and a deep appreciation for the arts, while nurturing their emotional development. And just from the look of our child, he loves this school too. I chose French School of Austin to give my girls the gift of a second language. I was not expecting how quickly they would begin understanding, singing, and speaking with no previous French exposure! Language immersion aside, the academics at French School of Austin are top notch. The small classes and individualized attention help each student to reach (and exceed!) his or her academic potential. Less than two months into the school year, my kindergartener is already reading in two languages, writing in print and cursive, and playing the cello! My daughters are flourishing at French School of Austin – I wouldn’t have them at any other school.